The much-anticipated signature bridge built on the river Yamuna in the National Capital, Delhi opened for the public from 05 November 2018. The completion of this project will reduce travel time between North and East Delhi. Ajman will also enjoy the panoramic view of the city from this bridge. Delhi Chief Minister Kejriwal inaugurated the Signature Bridge on November 04, 2018. On this occasion, along with Deputy Chief Minister Manish Sisodia, many ministers and MLAs of the Delhi Government were also present. 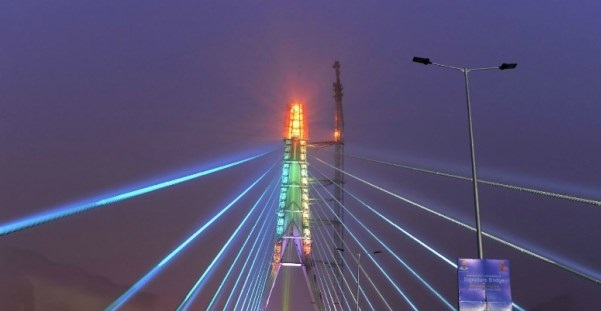 The height of the main pillar of Signature Bridge is 154 meters. There are 19 stand-cables on the bridge, which has prevented a pile of 350 meters from the bridge without a bridge. Mirrors have been mounted around the top of the pillar. The work was going on and off between 2007 and 2018 on the 1.8 kilometres long signature bridge. There will be a four-lane road on both sides of this bridge. This bridge has a pillar of 154 meters in the middle. A lift is arranged in the pillar itself. This bridge will serve as a tourist destination with a 154-meter high glass box which will provide tourists 'birds-eye views' of the city. To increase the beauty of the night, street lighting and high mast lighting has been done in the main bridge.